Burning Man 2007: World’s Largest Temporary City, Green? 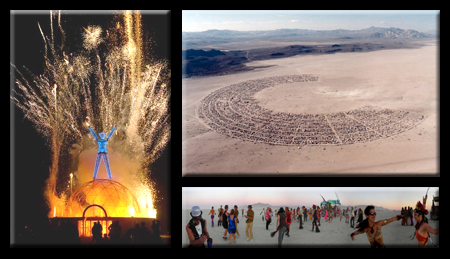 Burning Man is an amazing annual event that takes places for one week a year in the remote Black Rock Desert. This location, also dubbed Black Rock City, is home to art and artists from around the world. While it lasts, Black Rock City is the 7th largest urban environment in Nevada. Burning Man is both an art festival and survivalist experience, and has been compared to Mardis Gras and Rainbow Gatherings. This year, however, sustainability has become the focus, epitomized by the theme: The Green Man. The Burning Man festival has a dubious reputation at times, promoting a leave-no-trace ethos of environmental sustainability, while drawing crowds by carbon-producing land, sea and air vehicles from around the world. Starting today, however, participants are working to offset the environmental impact of the event in a variety of innovative ways. Projects like The Cooling Man have been raising participant awareness about ecological impacts for some time. With this year’s theme, however, the interest in environmental activism has spread to on-site art projects like Mechabolic. This interactive piece of art allows people to walk through it while it processes festival garbage into biofuels. As Burning Man continues to grow and become a recognized wonder of the world, will the festival be able to keep up with environmentalist criticisms both from participants and the outside world? It is hard to be sure, but The Green Man theme seems like a good place to start. 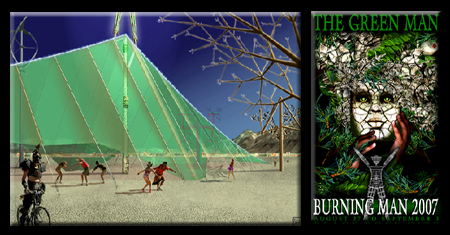 For more art related to this year’s theme visit the Burning Man website. Also check out this book of amazing Burning Man photography.